CHECHESMITHNATION : Hot Pink Blazer...A Way To Dare!!! 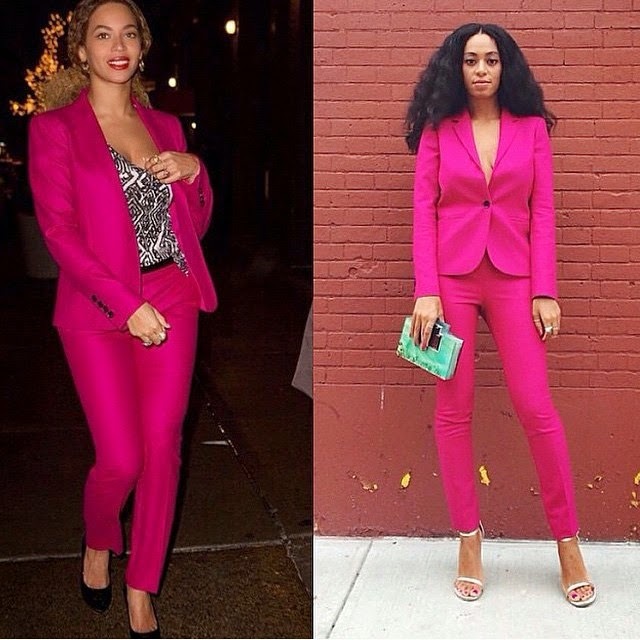 Beyonce was spotted in New York city on Monday wearing a pink jumpsuit, very similar to the one her kid sister Solange rocked some time ago. The 'Love On Top' singer polished off her complexion with a slick of scarlet lipstick and a touch of golden eye shadow, with her curly locks pulled back into a relaxed pony tail. Hot pink is what most people would be scared to pull off,but she slayed it. She paired her bold suit with a festive top and narrow belt that made her look gorgeous. The 33-year-old's bright look flashed her ample cleavage as she enjoyed a parents-only outing with her husband Jay-Z in New York City .